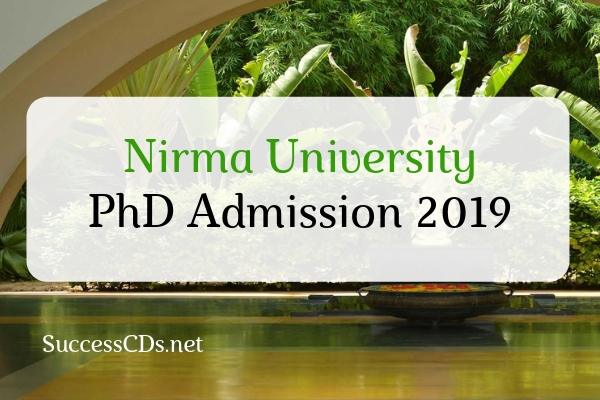 Nirma University is a statutory University, established under the Act passed by the Gujarat Legislative Assembly in year 2003 and recognized by the University Grant Commission(UGC) under Section 2(f) of the UGC Act and accredited with grade ‘A’ by the NAAC. Candidates possessing a Degree considered equivalent to M.Phil. Degree of an Indian Institution, from a Foreign Educational Institution accredited by an Assessment and Accreditation Agency which is approved, recognized or authorized by an authority, established or incorporated under a law in its home country or any other statutory authority in that country for the purpose of assessing, accrediting or assuring quality and standards of educational institutions, shall be eligible. The University will decide on an annual basis through Faculty of Doctoral Studies & Research a predetermined and manageable number of Ph.D. scholars to be admitted depending on the number of available Research Supervisors and other academic and physical facilities available, keeping in mind the norms regarding the scholar- teacher ratio. The domain expert will be decided by the Dean concerned. The selection criterions for the admission in PhD Programme are as under. An interview/viva-voce to be organized by the University when the candidates are required to discuss their research interest/area through a presentation before Department Research Committee specified. The candidates who qualify the UGC-NET (Including JRF) UGC-CSIR NET (Including JRF) SLET/ GATE/GPAT with a valid score in terms of cut-off marks and duration, teacher fellowship holder or who have passed M.Phil Program Shall be exempted from appearing in the entrance test and deemed to be qualified for personal interview. The interview/viva-voce shall also consider the following aspects, viz. whether - the candidate possesses the competence for the proposed research; the research work can be suitably undertaken at the Institution; the proposed area of research can contribute to new/additional knowledge. Final merit shall be based on the merit of interview/viva-voce. The Application Form Processing Fee for the Ph.D. Programme is Rs. 1250/- (non-refundable). The application will be considered complete only after payment of the Application Form Processing Fee through online mode.